Can I tell you something? Typically, when I think of BEING BRAVE (this month's theme on This is Thirty Four), I think of things like fighting cancer, standing up for social justice issues or climbing Mount Kilimanjaro. What I don't think about when I hear the words BEING BRAVE, is starting a business. Can I tell you something else? I WAS WRONG. Over the past few months, I've seen firsthand the incredible amount of courage it takes to launch a company and pursue your dreams. I've also realized more than ever that it truly does TAKE A VILLAGE to help you pursue your dreams. That's why I'm ridiculously excited to share this interview with Komae founders Amy Husted and Audrey Wallace. I met Amy and Audrey at RISE last weekend and got a front row seat to watch the two of them boldly share their company and their passion. These women did not waste a single opportunity to tell people about Komae and how it helps women build relationships and save money through swapping free babysitting with friends. When they got five minutes with Rachel Hollis? They told her about Komae. When they met Jen Hatmaker? They told her about Komae. Watching them BE BRAVE and tell people what they're doing and why it matters was inspiring...AND IT WORKED! Rachel Hollis mentioned Komae on stage and gave Amy and Audrey the chance to talk about the app in front of the entire conference! I just downloaded Komae and started sending it out to friends that I already swap sits with. The app is perfect for church groups, book clubs, neighbors, anyone in your circle of friends who you trust and want to build a relationship with. In a world where busy schedules and social media make us simultaneously more and less connected, Komae does more than just facilitate free babysitting. Amy and Audrey's company reinforces the importance of friendship and face-to-face interaction and challenges us to be the village for our friends and their families. Whether you're building up the courage to launch a company, need to know how to pitch investors or want to find a free and easy way to get babysitters, you will love this interview. Jenn Prentice (JP): Tell me about yourselves. Amy & Audrey (A&A): We are two stay-at-home-moms (SAHMs) turned co-founders. We share a dream and the determination to bring it to life, but we also have very different skill sets and personalities. We believe that our differences are what make us successful as co-founders. We build this belief into the Komae brand as we encourage other moms to be who they are without guilt and shame. We believe you can have different opinions and do life differently, while still maintaining a friendship and living life together. JP: So, what is Komae and what inspired you to start it? A&A: Komae is an app that empowers parents to exchange free babysitting with their personal network of friends—a solution to a very real problem to find trusted, affordable, guilt-free care for our children. We were two stressed out SAHMs, each trying to run our own side hustle while maintaining healthy marriages, friendships, and self-care. The balancing act of mommy-hood is no joke. And it can quickly leave women feeling defeated and depleted, making way for the dreaded and inevitable mommy guilt. So we decided to do something about it. We put together a traditional babysitting co-op between us and 10 of our closest friends. After running this co-op for a year, our 10 friends had exchanged babysitting 165 times (nearly every other day!) and had saved $10,000 in babysitting costs. Friendships were strengthened between the moms and the kids. Marriages were strengthened because date night was no longer just a dream. And parents were getting the chance to do a few more of the want-to’s in life. It was glorious. As we were beginning to catch the attention of other moms in our community, along with long-distance friends who were looking to recreate something like this for themselves in their neighborhoods, the wheels began to turn, and began develping the Komae App! JP: Talk about the process of launching the app. What has the last three years of your life since launching looked like? A&A: How exactly do two SAHMs go about developing an app? Well, if we had really known the answer to that, we may not have tried. Lucky for us, as first-time entrepreneurs, we didn’t know better than to throw our heart and soul into this crazy dream. And throughout every step of our journey, our ‘why’ has been stronger than every ‘why not’ that could be thrown our way. The past three years have been a whirlwind. All we set out to do was bring free babysitting to families around the world, yet we found ourselves in business meetings learning more about technology, fundraising, HR, business development and legal than we ever imagined. We took every meeting and said yes to every networking opportunity. We participated in multiple business accelerators, the most noteworthy of all being Project Entrepreneur in NYC. People always told us it would take twice as much time and money. What I didn’t realize is that it would make us twice as strong. JP: What are your top 3 recommendations for someone looking to create an app or launch a business? Go for it, but don’t go for it alone. If you can, find a co-founder. If you can’t, then make sure you connect yourself with the entrepreneurial resources in your town. Entrepreneurship is not an easy journey and you will need to have others around you to pick you up and push you on when times get hard. Show up and speak up. You never know which networking event you attend or hand you shake is going to be the one that takes you to the next step. Showing up is the first step, but make sure you speak up while you’re there. Make yourself known. Ask about others. Leave an impression. It takes a village to raise a child, but we also believe it takes a village to build a business. Get some grit. Without grit, entrepreneurship will break your heart. Not everyone will love what you’re building. You will have investors tell you no. People on social media will say rude things. But you’ve got to desire success more than you care about the opinions of the crowd. Because along the way, if you hold onto that grit, you will find your supporters, your cheerleaders, and your niche. JP: You have investors. Talk about the process of putting together a pitch. A&A: Over the course of the last three years, we have won ten pitch competitions and lost one. Not a bad batting average! Our pitch competition success resulted in many equity-free grants and also local press. These wins were truly the building blocks of our funding story. As for pitching investors directly? We can’t count how many of those meetings we’ve had. 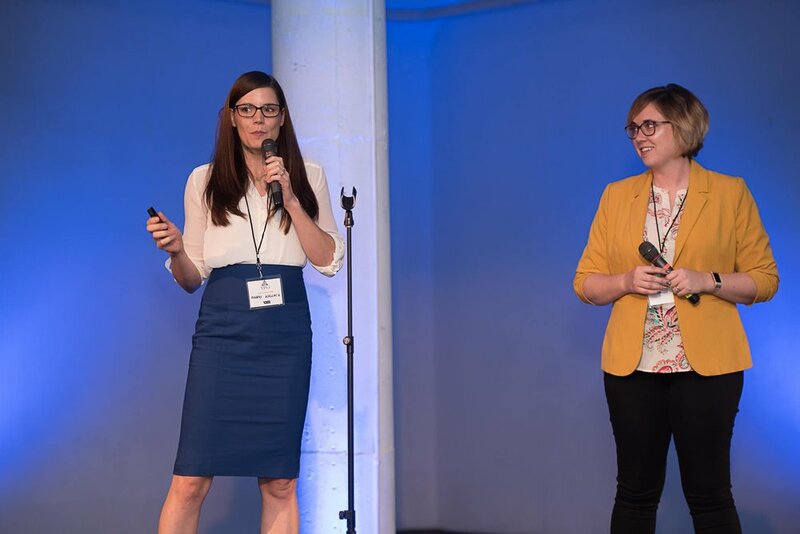 Winning over an investor is challenging, especially being two female entrepreneurs solving a problem felt primarily by millennial females. The average investor isn’t a millennial female that has felt the pain of our customer, so getting them to see the need and buy into what we’re building isn’t easy. Where we have been most successful at receiving investments is when pitching local female investors. In fact, a group of 20 women in Northeast Ohio recently came together for a combined investment of $125,000. It was incredible! JP: I've seen you pitch Jen Hatmaker, and I know you pitched Rachel Hollis. That took guts. What does BEING BRAVE mean to you and how do you find the courage to do things like pitch famous people you've just met? A&A: BEING BRAVE is all about stopping and asking yourself, “what is the worst that could happen?” Usually the answer is very insignificant. Rachel could have chosen not to respond to our Instagram message. Jen could have nodded and smiled and excused herself to the restroom. Neither of them would have laughed or poked fun because even if they wanted to, that would have looked bad on them. So really, what was there to lose? On the other hand, what was there to gain? Did we really believe Rachel would reply to our Instagram message, invite us to RISE and say she’d love to hear more about our business? And that she would go as far as to call us out from the stage and tell the whole conference about Komae? Heck no! But she did! If we had lived in fear rather than in faith, we would still be sitting on the other side of the computer wondering “what if?” And that’s not the way we want to live our lives. We’d rather rise. JP: “Living in faith, rather than fear.” That’s good stuff and something that I not only strive to do but also want to pass on to my boys. You are both moms as well. How have your kids inspired your work? A&A: Our company is 100% inspired by our kids. If we didn’t have them, then we wouldn’t need to swap babysitting with each other and wouldn’t have realized the problem we needed to solve. Bonus: since you hand-select your village on Komae, that means you hand-select the role models your kids have in their lives. My kids are building relationships with their peers and with the other parents I trust to have an influence on them. JP: Part of what This is Thirty Four is all about is living with intention and leaving a legacy. What type of legacy do you hope to leave after your time on this earth is through? A&A: At Komae, we hope to grow a brand that becomes a household name. We hope that Komae becomes a verb and that you hear people say “Hey Honey, let’s Komae the kids and go on a date night.” If we accomplish this goal, then we will be leaving a legacy that says community is important. Date night and prioritizing your spouse is important. Taking care of your mental health as a new mom is important. Life isn’t meant to be lived alone. JP: This is all so good and so useful. How can people find you guys?